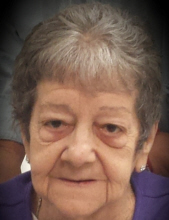 Phyllis Jean Christy, 84, passed away peacefully, surrounded by her loved ones, at 5:58pm on Monday, February 4, 2019 at Rosewood Care Center. She was born on September 17, 1934 in Orient, IL, the daughter of the late Edward and Lucille (Bertagna) Karpan. She was preceded in death by the love of her life, James “Jim” Christy, who she spent 64 happy years of marriage with. Phyllis and Jim married on September 29, 1951 in West Frankfort, IL. Other survivors include her children and spouses, Larry Christy, Cheri and Herman Whitehead, Jimmy Christy, Janet and Don Ward; six grandchildren and their spouses, Chad Meadows, Kyle Meadows, April and Derek Pennington, Matthew Christy, Mindy Young-Lawson and Ryan Lawson; nine great-grandchildren, Chad-Alan Meadows II, Alonna Meadows, Hailey Curtis, Zachary Pennington, Jordan Pennington, Dylan Meadows, Andrea Ethington, Gloria Christy, Levi James Christy; and three grand-dogs that she was especially fond of, Pooh Bear, Little Bit and Carly. She was also preceded in death by her brother, Charles “Charlie”Karpan. Phyllis was a former Avon sales representative in West Frankfort, IL for over twenty years. She was a member of the Harmony Free Will Baptist Church in West Frankfort for several years. She enjoyed spending time with her kids, grandkids, her great-grandkids, and shopping. In celebration of her life, visitation will be from 9:00am-11:00am on Saturday February 9 at Union Funeral Home in West Frankfort, IL. Funeral services will directly follow at 11:00am with Brother Mike Cash officiating. Burial will be in Denning Cemetery on the Orient Road. To send flowers or a remembrance gift to the family of Phyllis Jean Christy, please visit our Tribute Store. "Email Address" would like to share the life celebration of Phyllis Jean Christy. Click on the "link" to go to share a favorite memory or leave a condolence message for the family.